Croatia’s coastline winds its way past more than 1000 islands, ranging in size from tiny to tiniest and offering a host of scenic villages and landscapes to enjoy. From mysterious Ciovo to dramatic Sveti Nikola there are 66 inhabited islands off the coast of Croatia, as well as plenty of uninhabited gems waiting to be explored. Make the most of the catamarans and ferries that run from Split and Dubrovnik, and set sail on an island adventure, Croatian style, to some of these picturesque locations. Between May and October, small passenger boats set sail from Porec to Sveti Nikola every half an hour. This pint-sized island is home to serene sandy beaches and an abundance of lush forest, and is affectionately known as the Hawaii of the Budva Riviera. Sveti Nikola is quiet enough to have been branded traffic-free, and is an ideal place to spot roe deer and rare birds, but with enough life in it to find fantastic dining options as well as scenic sights. 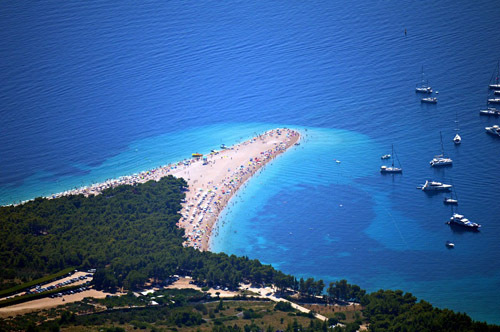 Home of the famous Zlatni Rat beach, star of many an Instagram photo, Brac is unquestionably one of the most beautiful islands the Adriatic has to offer. Hikers will enjoy the rolling hillsides, sporty types can get stuck in to windsurfing and kayaking, and those in favour of nothing but relaxation can choose between time spent sunbathing on Zlatni Rat and hours whiled away in cosy bars of the historic town centres. Regular ferries run from Split and Makarska to Brac, which happens to be one of the most accessible Dalmatian islands as well as one of the most good-looking. Marvel at 13th-century walled towns and gothic architecture, bask on the beaches or stroll through miles of lavender fields to get the perfect holiday photo-opportunity. Hvar is brimming with cafes and bars, giving it an undercurrent of party edge to boost the island’s already extensive appeal. If you find yourself this way, make sure you find time to head to the abandoned village of Malo Grablje – which has just one inhabited building, a restaurant. Offering unbeatable mountain views and authentic Croatian cooking, the Stori Komin restaurant receives rave reviews from travellers who stumble upon it. A mere 5-minute drive from Dubrovnik sits Ciovo, a quaint island packed with charming architecture that is best accessed by drawbridge from the mainland. Cross over the Medieval threshold and soon you’ll be venturing through deciduous forests and olive groves, with the chance to marvel at old churches and cobbled villages on your way. There are vineyards on Ciovo, and it’s worth stopping for a glass of the local wine before you head elsewhere. 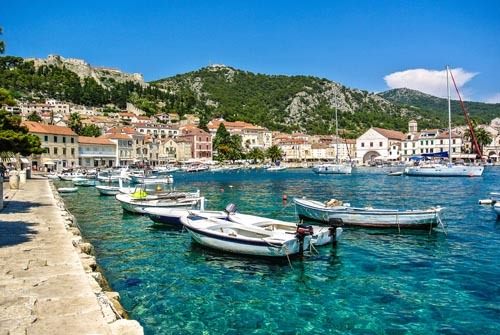 Known for its white wine and black forests, Korcula is the second most populous island in the Adriatic and home to numerous vineyards and quiet hamlets to explore. Seek out the freshest catch of the day in fishing villages that line the coast, or walk along the fortress walls of the Old Town area. Catamarans run here from Split, via Hvar, and from Dubrovnik between June and September. Stop off for golden sands and a host of restaurants, and stay for the incredible panoramic views.